This news is very much of the ‘we were tipped into a swamp and lost nearly everything, but we escaped the alligators with our lives after each losing half a leg’ variety, but the staff at Durham Cathedral Shop have – 4 years after the saga to which this blog is devoted kicked off – received some more good news. It has been ruled that when the staff of the Durham Cathedral Shop were thrown out of their jobs in January 2010, it constituted redundancy and unfair dismissal. Since Mark and Phil Brewer have done a vanishing trick after running the business into the ground (don’t forget that Phil Brewer used the shop to fund his Trotter-Trading Yellow private aeroplane, and that hundreds of thousands of pounds simply went missing), the Judge rules that payment can be made from State funds. I should also say that this decision was by a previous shop management, and the shop – and particularly the staff – deserve full support. An Employment Tribunal held on Wednesday 24th August 2011 in Newcastle, and this is a report of the proceedings. The opening comment by Mr Jim Shepherd, Employment Judge, at the Employment Tribunal held on Wednesday 24th August 2011 in Newcastle, between the claimants, the staff of the Durham Cathedral Shop, and the Durham Cathedral Shop Management Company and the Secretary of State for Business Innovation and Skills. The start of the tale was on 22nd January 2010, when the staff of the Durham Cathedral Shop were all dismissed. The shop was one of the 23 SPCK Bookshops taken over in 2006 by the St Stephen the Great Charitable Trust run by American brothers, Mark and Phil Brewer. In 2008 the Durham shop’s management transferred to the Durham Cathedral Shop Management Company, a new company set up by the Brewer brothers. By January 2010 Durham was the only shop remaining under their control, and was a poor shadow of the flagship shop it had been in SPCK days. Phil Brewer contacted the staff and said the company had financial difficulties and he needed to talk to the Cathedral Chapter. On 22nd January 2010 the staff were summoned by the Chapter Clerk, following his discussion with Phil Brewer, and were told the shop was to close immediately. The staff received no written notice of dismissal, were not consulted in accordance with UK employment law and did not receive wages due to them, severance payment nor redundancy payment. The staff were represented by Sara Devennie, of Beecham &amp; Peacock, Newcastle solicitors, who were instructed by the trade union USDAW, of which all the staff are members. Beecham & Peacock received no fee for this work as part of their on-going commitment to a number of trade unions to fight for the rights of workers. The Tribunal were presented with the detailed and complicated facts of the case, and ruled that it was unfair dismissal and redundancy. The Secretary of State’s office had investigated the solvency of the Durham Cathedral Shop Management Company and stated it was not insolvent and was still registered as a company, with the registered trading address as the Durham Cathedral Shop. However, the Tribunal Judge stated he felt it unlikely that any money would be forthcoming from the USA. By ruling that redundancy had occurred, the Judge legalised the claim for state redundancy payments to be made by the Secretary of State. Payments of between £2,000 and £11,000 were awarded to the staff. That is excellent news, and congratulations go especially to the one member of staff who persevered with the claim. Perhaps ways can now finally be found to look forward at Durham. There are still some very serious questions around the whole SPCK saga, which I hope will be addressed somehow. The Brewers still deserve to be brought to book for offences committed throughout the last several years. These include the magically vanishing funds from Durham Cathedral Shop mentioned above. But there is also the small matter of money specifically given for the support of Christian Bookselling in Newcastle, and placed in a separate fund withing SPCK after the sale of the Bible House Bookshop, part of which seems to have been misappropriated during the time of Management by the Brewer Brothers after SPCK agreed to provide funds. Questions around the Governance of SPCK itself, and decisions made. And the whole question of who is going to learn which lessons from this whole Godawful Mess, and whether they actually have been learned? Today we have a victory: the last bookshop in the country to remain in control of J Mark and Philip Brewer, the Shyster-Charlatans who have taken hundreds of thousands of pounds from the chain, while abusing and exploiting staff, has been closed. It was in Durham Cathedral, and will soon be re-opened under proper control. The Durham Cathedral shop was the last remaining former SPCK bookshop run by the St Stephen the Great charity (SSG). SSG were given the bookshops by SPCK in 2006. The Shop which was managed by St Stephen the Great is now closed. A new shop under the management of The Cathedral Chapter will open in due course. Please check the Cathedral Website for the latest news. No more comment yet, but we are all allowing oursleves to dance a small jig at this point. However we are still watching, because there are the interests of the members of staff at stake here, and then there will be the small question of what sort of shop will be reopened. 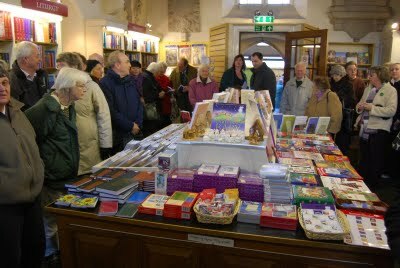 A crowd of 60-70 people squeezed into St Olav Christian bookstore at 10:00 am on Saturday 12 December for the opening service led by the Rural Dean for Chichester, Richard Hunt. The picture shows the crowd beginning to gather, at about 9:55. We have been highlighting Brewer non-payment of creditors for a long time now, mainly through data about unpaid creditors and more than £1m of debts from the period summer 2007 to summer 2008, which came into the public domain when J Mark Brewer purported to take “Saint Stephen the Great LLC” into Bankruptcy in Texas in 2008. This is only the tip of the iceberg, however. Throughout the period 2008/9 the recruitment agency staff were supplied to the latest operating company (ENC Ltd) running the former-SPCK Bookshops, even while the Charity Commission were investigating Brewer mismanagement. As with the previous generation of creditors shafted the year before, invoices were simply not paid. In this case the debt is £15,500. Thanks to Paul, who left this comment on our “2 week warning” post on December 7th. We are the recruitment agency that supplied the staff to the Brewers during 2008 / 2009. Although we had a good working relationship with Philip Brewer at the start we have been left out of pocket to the tune of £15,500. We thought that supplying staff to a Christian organisation would have been to some extent a “safe bet” only to be proved wrong. We are an independent agency and losing this amount of money is, as you can imagine a huge blow to us. As we were supplying ENC Shop Management we probbly have no claim from SSG charity. May I add that throughout this relationship all staff were paid in full every week and no one other than ourselves are out of pocket. It’s very sad reading through the posts that the Brewers won’t tough up and pay their creditors. Since they are based in the USA we are finding it increasingly difficult to speak with them, but we’re not going to give up. We applaud that you have treated staff fairly despite the way you have been treated. Mark and Philip Brewer run a Christian organisation? Yes – like water runs uphill! They seem to simply ignore words until people give up and go away – and plenty have written debts off, but have been known to respond to embarrassment or legal action. They may be past responding to embarrassment now. We have no real knowledge of the position of ENC Ltd, or if it has assets which can be recovered – but I think that they will happily stonewall creditors until the cows come home. The only company that we *know* is trading is that running the Durham Cathedral Shop. After our letters in the Church papers and The Bookseller last week, we have had some attention in the church and trade press for the tricks and fiddles which have been perpetrated on suppliers by organisations run by J Mark and Philip W Brewer. In the past suppliers have nearly all kept quiet about how their invoices have just been left hanging for months, or how shops have continued selling the same stock under a new operating company, while the suppliers of the stock have been told to take their invoices away “to the old operator”. J Mark Brewer’s sworn declaration to the Texas Court revealed £1m+ of unpaid debt from the period summer 2007 to summer 2008. And yet in 2008 and 2009 a new generation of suppliers were being signed up, fiddled, and left high and dry by a new set of operating companies, with three, four or five figure invoices unpaid, even while the Charity Commission were investigating the previous generation of fiddles. These are suppliers who are dealing with what they are being told is a “Christian Business”, and/or are part of the ecosystem around the Christian Bookshop trade. We are now focusing on this aspect of this saga. We are calling on suppliers to write in to the Church Papers or the Bookseller between now and Christmas to outline what has happened, and how you have been treated. We will be running some accounts and examples here as they come in too, and (we hope) have an interview or two and pass stories on to the media. We do not think there will be another chance to do this. Keep it short, sharp, snappy and factual. 100-200 words is enough. Make sure that your account is one you are willing to stand behind. We think that most of the Church papers have pulled or edited articles in response to Brewer threats in the past, so if you have controversial things to say, send it to The Bookseller. Cover who you are, what happened, what you are owed, and which business you were dealing with. If you really don’t want to go public, ask them not to reveal your name. Send it to us anyway via this form, and we’ll publish it here too. Please mke clear if you want us to withhold your name, or if your account is not for publication (e.g., if it is evidence of criminal activity). I mentioned in a previous posting that we had written to a number of outlets to publicise the call for Creditors of the former-SPCK bookshop chain, and to raise a number of concerns about the way the brevity of the deadline, and the narrowness of the subset of creditors likely to see a notice placed only in The Bookseller. Edited versions of our letters have been published in both the Church Times and the Church of England Newspaper, and the full letter in The Bookseller. Christian Marketplace has also carried an article on their website about the Call for Creditors. We hope, in particular, to start a wider debate in the Book Trade about the nefarious activities of the Messrs Brewer over the last several years, which is long overdue. In our view, and based on published and unpublished information, a criminal investigation is more than merited. The Church Times edited out the bits about the deceptive 2008 Bankruptcy attempt in Texas. We are grateful to all publications which carried the letter. We write as the editors of the SPCK-SSG News Blog (spckssg.wordpress.com). We have been working, with many others, to scrutinise the management of the former-SPCK bookshop chain for 2 years now. The chain of bookshops was taken over in October/November 2006 by a charity controlled by J Mark Brewer and Philip Brewer, and has been gradually run down since that date. At least 7 different corporate entities have been used to in managing the chain. These comprise 3 charities (1119839, 1119839-1 and 1109008), 3 private companies (FC028292, FC028290, FC028291), and a Company Limited by Guarantee (06110519); some have similar or identical names, and all were controlled at the outset by various permutations of Brewer family members. After complaints in 2008, and after a Charity Commission “Section 8” investigation (case ref WTF 1119839/685451), in April this year an “Interim Manager” was appointed to oversee the Saint Stephen the Great charity (1119839), and the Saint Stephen the Great Charitable Trust ( 1119839-1). Last week The Bookseller included a notice from the Interim Manager, suggesting that “Creditors who believe that they have a valid claim against the Trustees of St Stephen the Great Charitable Trust incurred before 1 July 2007, should write to the Interim Manager at Begbies Traynor (Central) LLP, 32 Cornhill, London EC3V 3BT under ref S8703 before the close of business on 16 December 2009.” This notice causes us several concerns. As far as we are aware the notice has only been published in The Bookseller, while the SPCK chain was a business with worldwide links. SPCK creditors may include English Cathedrals, communion wine suppliers, development charities, craft businesses, religious communities in the UK and overseas and others. How can such a range of creditors can be realistically expected to respond to a notice with a 3 week deadline in a booktrade magazine, posted up to 3 years after the relevant debts were incurred? In summer 2008, J Mark Brewer attempted to take an organisation, which he called “St Stephen the Great, LLC”, into bankruptcy in the South Texas Bankruptcy Court (case 08-33689-H1). His court submission failed to identify the UK bookshops under his control, but did provide a substantially accurate listing of unpaid debts which had arisen over the previous 12 months. This included several hundred creditors, and more than £1m of debts. This case was subsequently dismissed “with prejudice”, and Mr Brewer – himself a lawyer and former Congressional Candidate – required to pay a penalty and take remedial education in the area of Legal Ethics. Under the quoted cutoff date of July 2007, many debts identified in these court submissions may be ruled out of a possible settlement. We encourage all potential creditors to get in touch with the Interim Manager using the contact details in the notice, and/or those given on the Charity Commission site; these are stsgct@gothamerskine.co.uk via email, or by phone on 020 7490 1880. We also hope that specific contact will be made with creditors identified in the Court Documents, who are potential creditors even within the restricted period, and that the deadline for responses will be extended to a more realistic date. First of all we must thank the Interim Manager appointed to oversee the Saint Stephen the Great Charitable Trust, and Saint Stephen the Great, charities for his work in “stopping the rot” in the former-SPCK bookshop chain, and recovering the shops (Durham Cathedral Bookshop excepted) from Philip and J Mark Brewer. At least we are now on the way *out* of the woods. 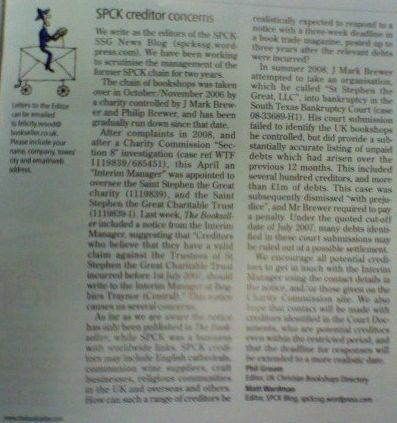 However, we note that last week The Bookseller trade magazine included a notice from the Interim Manager of the Saint Stephen the Great Trust, suggesting that “Creditors who believe that they have a valid claim against the Trustees of St Stephen the Great Charitable Trust incurred before 1 July 2007, should write to the Interim Manager at Begbies Traynor (Central) LLP, 32 Cornhill, London EC3V 3BT under ref S8703 before the close of business on 16 December 2009.” This causes us some concerns. We have been working to scrutinise the mismanagement of the former-SPCK bookshop chain for more than 2 years now, and we are concerned by several aspects of the statement made by the Interim Manager. The Interim Manager is completely right that this whole affair has been made fearsomely complex by the use by J Mark and Philip Brewer of at least 7 different corporate entities to obfuscate their actions over the last 3 years. These comprise 3 charities (1119839, 1119839-1 and 1109008), 3 private companies (FC028292, FC028290, FC028291), and a Company Limited by Guarantee (06110519), some of which have similar or identical names, and all controlled by various permutations of Brewer family members. There was also an 8th alleged corporate entity, SSG LLC, which appeared in J Mark Brewer’s sworn submissions to the South Texas Bankruptcy Court in summer 2008, but which turned out to exist only in his imagination. The USDAW Employment Tribunal action, which was settled out of court earlier this year, was impeded by this complexity, and a lack of clarity as to which entity J Mark and Philip Brewer were acting on behalf of at different times, whether their actions at each point were legal or not, and their peculiar reluctance to keep written records. In the end USDAW had to name three separate bodies as respondents because it was not clear which entity employed and managed different members of staff at different points in time. If the Interim Manager had not commendably reached a negotiated settlement, this Tribunal would be going round in ever-decreasing circles even now. The notice as published seeks creditors of “St Stephen the Great Charitable Trust”, without identifying a specific charity number, and restricts the call to debts incurred before the end of June 2007. Given the confused governance and business relationships, we suggest that the Interim Manager needs to cast a far wider net, at least initially. We are also concerned that the deadline for responses to the notice has been set for December 16th. The SPCK bookshop chain was a business with worldwide links, and the range of creditors may well include Cathedrals owed rent, communion wine suppliers, development charities, craft businesses, religious communities in Eastern Europe, a consulting engineer used to design an improvement scheme, and others. All of these creditor groups appear in the 2008 Texas court documents referred to above, and – despite the 2008 bankruptcy attempt having been fraudulent – we have found the records of debtors declared to be largely accurate. We are a little baffled as to how such a range of creditors can be realistically expected to respond to a notice with a 3 week deadline in a Booktrade Magazine, posted up to 3 years after the relevant debts were incurred. Also, would a single notice adequately meet legal requirements where such a wide range of creditors are affected? So we urge all creditors, and potential creditors, to get in touch with the Interim Manager using the contact details in the notice, and/or those given on the Charity Commission site, which are stsgct@gothamerskine.co.uk via email, or by phone on 020 7490 1880. We have done what we can to bring wider attention to the published notice, but we hope that specific contact will be made with the hundreds of suppliers identified in the Court Documents, who are potential creditors even within the period before June 2007. Any debts before this date would be in addition to the more than £1m of debts identified in the 2008 Court submissions. We also hope that the deadline for responses will be extended to a more realistic period, perhaps to the end of January 2010. A fuller version, with a few points about the J Mark Brewer attempt (known to us as the Great Texan Wild Goose Chase) to dodge debts by putting a sort-of conflation of various bits of his organisations into Bankruptcy in South Texas, declaring lots of debts but none of the assets, is in this week’s Bookseller – but they don’t always put letters online. We must thank the Interim Manager appointed to oversee the Saint Stephen the Great Charitable Trust, and Saint Stephen the Great, charities for his work in stopping the rot in the former SPCK bookshop chain, and recovering the shops (Durham Cathedral Bookshop excepted) from Philip and J. Mark Brewer. At least we are now on the way out of the woods. We note, however, the notice from him in The Bookseller last week suggesting that creditors “who believe that they have a valid claim against the Trustees of St Stephen the Great Charitable Trust incurred before 1 July 2007” should write to him at: The Interim Manager, Begbies Traynor (Central) LLP, 32 Cornhill, London EC3V 3BT, under “ref. S8703” before the close of business on 16 December. This causes us some concerns. The Interim Manager is completely right that this whole affair has been made fearsomely complex by the use by J. Mark and Philip Brewer of at least seven different corporate entities over the past three years. These comprise three charities, three private companies, and a company limited by guarantee, some of which have similar or identical names, and all controlled by various permuta­tions of the Brewer family members. The notice as published seeks creditors of “St Stephen the Great Charitable Trust”, without identifying a specific charity number, and restricts the call to debts incurred before the end of June 2007. Given the confused governance and business relation­ships, we suggest that the Interim Manager needs to cast a far wider net, at least initially. We are also concerned about the deadline for responses. The SPCK bookshop chain was a business with worldwide links, and the range of creditors may well include cathed­rals, communion-wine suppliers, development charities, craft busi­nesses, religious communities in Eastern Europe, a consulting engineer, and others. All of these creditor groups appeared in Texas court documents in 2008. We urge all creditors, and potential creditors, to get in touch with the Interim Manager using the contacts in the notice, and/or those given on the Charity Commission site stsgct@gothamerskine.co.uk, via email, or by phone on 020 7490 1880. We hope that a specific contact will be made with the hundreds of suppliers identified in the court documents. We also hope that the deadline for responses will be extended to a more realistic period, perhaps to the end of January 2010.